How To Grow POUNDS OF STICKY BOMBASTIC BUD In The Shortest Amount Of Time Possible? Quality LED lighting products are designed to deliver higher yields of produce in shorter time than standard HID lighting, increasing not only your weight per Watt-ratio, their specialized wavelengths also benefit your crops by increasing the spectral nutritional content resulting in higher THC production, which in turn increases your product’s marketability – smell, glistening stickiness, size, taste, and average bud-per-plant quality and worth. 12 Band Full Spectrum (including UVB and IR wavelengths) will result in better quality and a guaranteed higher yield. The most efficient internal heat management components available, crucial to maximizing LED life and spectrum stability. Largest heat sink in the industry for superior cooling and dramatically increased LED life. It’s estimated now 15-20% of yield is decreased with standard lighting methods using traditional HPS or MH lights due to this human-error reason. Now with advanced cannabis calibrated full spectrum LED lighting technology, you don’t hasve to worry or stress about your buds missing out at all. Your pot plants, for any phase of growth, are completely covered with everything they require for full healthy lush and vigorous growth – in every phase down to the millisecond. No more waste. 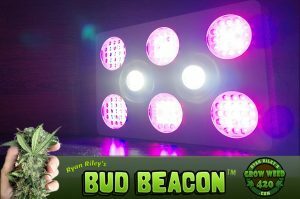 Now due to our modern propietary cannabis-tailored full spectrum lighting technology, any beginner can simply plug in their Bud Beacon and get pounds allstar frosty heavy nugs, the very first try!